The arrival of Europeans in the Americas brought with it a demographic catastrophe of vast proportions for the native populations. What were the causes? The surviving documentation is extraordinarily rich: conquistadors, religious figures, administrators, officials, and merchants kept records, carried out inquiries, and issued edicts. The native world, for its part, has also left eloquent traces of events as well as direct testimony of its harsh subjugation at the hands of the Europeans. Drawing on these sources, Livi Bacci shows how not only the 'imported' diseases but also a series of economic and social factors played a role in the disastrous decline of the native populations. He argues that the catastrophe was not the inevitable outcome of contact with Europeans but was a function of both the methods of the conquest and the characteristics of the subjugated societies. This gripping narrative recounts one of the greatest tragedies of human history, one whose protagonists include figures like Columbus, Montezuma, Atahuallpa, Pizarro, Corts and Tupac Amaru. Massimo Livi Bacci is Professor of Demography at the University of Florence. "An impressive argument for a more complex way of understanding the conquest of what is now Latin America than the single-cause explanations that have been dominant for the past several decades. The translation is lucid and easy to follow, and the generous contemporary illustrations of the life of the Indios at the time of conquest further enrich the text." "An excellent study ... the book provides fresh insights into one of the most catastrophic episodes of early modern history and the narrative thrust of the work makes it very readable." "Well-illustrated, useful and balanced ... an excellent provocative volume which should have wide appeal." "Bacci makes a significant contribution and should be applauded for tackling a difficult academic question. [He] commendably moves the discussion away from singular epidemiological explanations and refocuses debate on the multiple means and various trajectories involced in the conquest of indigenous peoples." 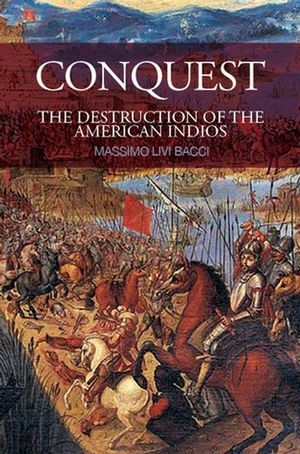 "Massimo Livi-Bacci's Conquest is a brilliant, fascinating history of the demographic catastrophe that enveloped the New World after 1492. Thickly illustrated with the artistic visions and voices of native peoples, it is the most even-handed, comprehensive narrative available - now in a lively, fluid English translation. Livi Bacci examines the evidence with the eye of a seasoned detective, solving a series of mysteries - in the West Indies, Mexico, Peru, and the Río de la Plata. Along the way, he finds much previously overlooked evidence, which he ingenuously assembles into a compelling, nuanced interpretation." "Was the decay of the Amerindian population man-made, or was it brought about by the uncontrolled spread of pathogens or some other factor? Massimo Livi Bacci, a world-leading demographer, joins, in the present translation of his well-read book, the centuries-long debate on the extent and the causes of the post-Conquest collapse, adding to the discussion fresh insights based on his expertise in population studies and on a judicious and thorough historical research."